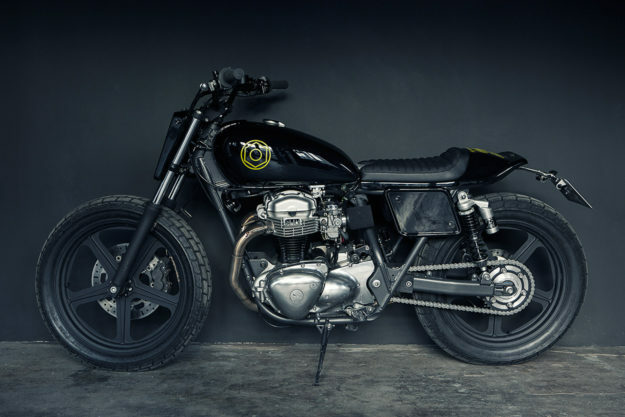 The dirt track revolution continues apace. Even the big guns are turning their eyes towards the ovals, and the latest to catch the bug are Nicholas Bech and Per Nielsen of the Wrenchmonkees. 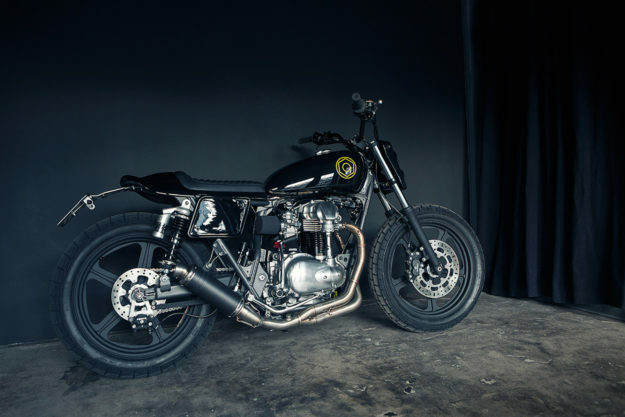 ‘MonoMonkee’ is a no-nonsense Kawasaki W650 adapted for the track, but still (almost) street-legal. “We’ve always been fans of the Kawasaki W series. Even though it’s not the lightest or most obvious choice for the track, the engine is bulletproof, reliable, and easy to maintain,” says Per. 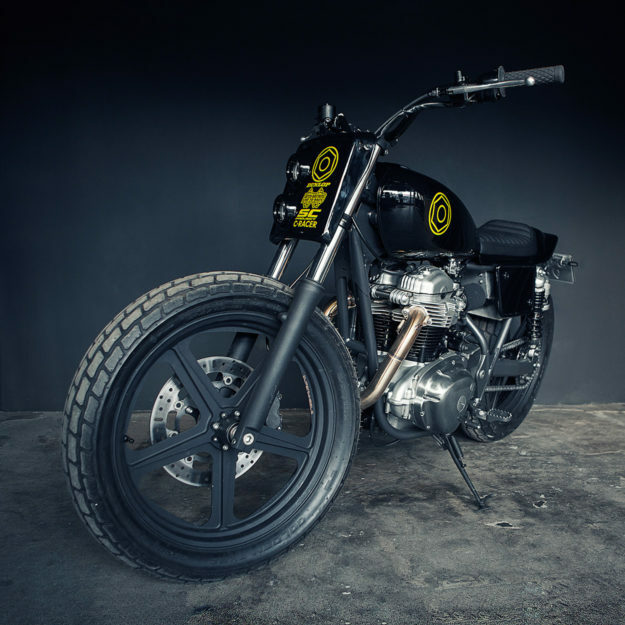 After thorough investigation, the boys settled on fiberglass from the Greek company c·racer: “Really nice parts with a very good finish.” Under the monochrome bodywork they’ve fitted an aluminum inner fender and a battery box. It’s the CNC’d wheels that jump out in the shots though, and the Wrenchmonkees have been itching to use them for quite some time. 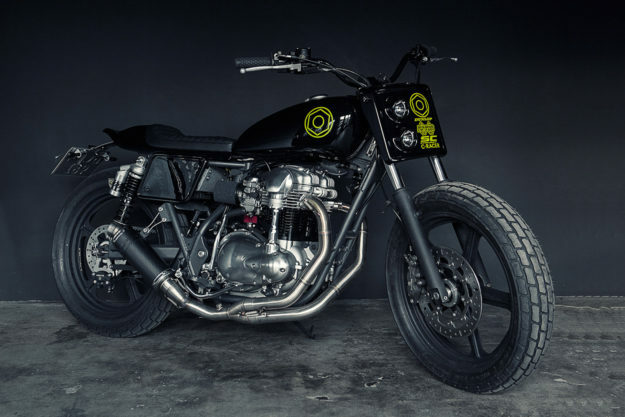 The SuperWheels don’t fit the standard Kawasaki fork and swingarm though, so custom-made spacers, caliper brackets and a sprocket carrier are had to be machined up to fit. 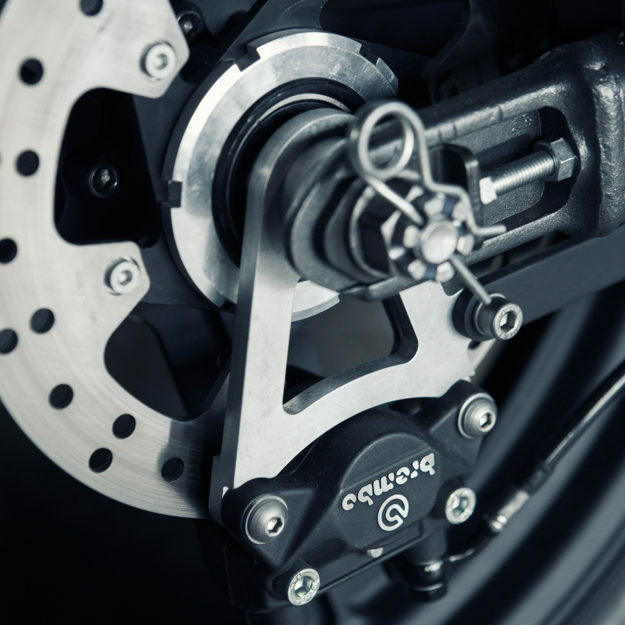 The brakes are TRW floating discs from a KTM 990 at the front, and a 690 at the rear, with Brembo calipers. The suspension is stock but lowered in the front. At the back, there’s a set of YSS RG fully adjustable shocks to help get the power down. 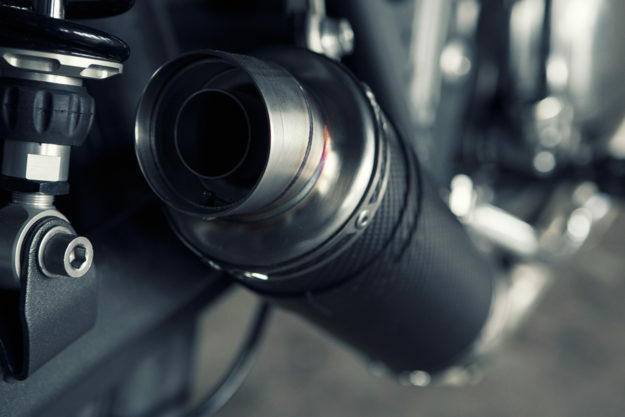 The engine internals are standard, but the Keihin carbs now breathe through UNI-filters and a jet kit. 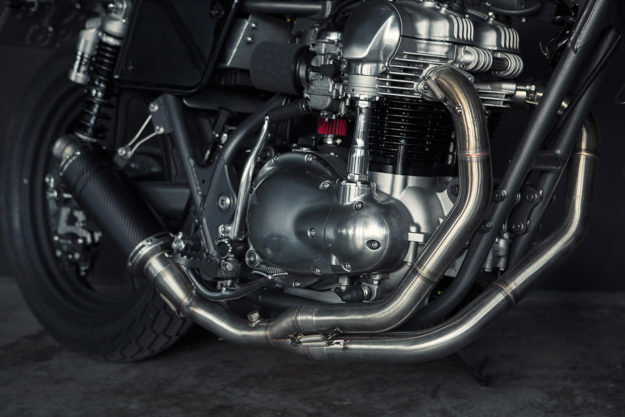 The sinuous, beautifully welded exhaust is a stainless system from the Italian company SC-Project, which makes the pipework for the Repsol Honda MotoGP team. 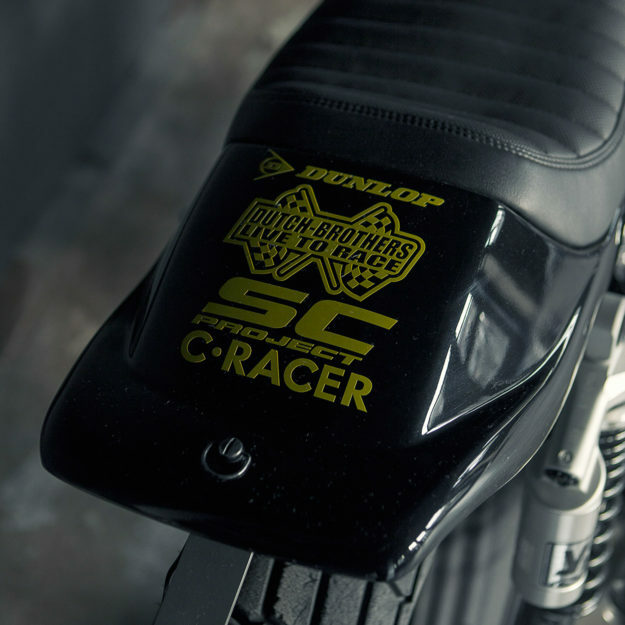 Originally designed for the W800, it’s now terminated with one of SC’s carbon GP-style silencers. Illumination comes from c·racer headlights, plus a taillight and rear turn signals from the German brand Highsider. 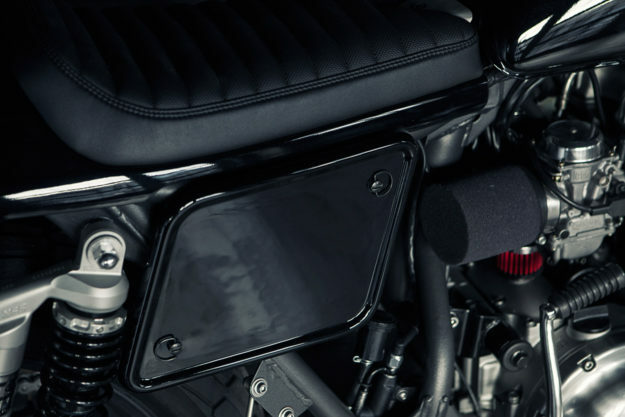 Motogadget supplied the front turn signals and a Motoscope speedometer. 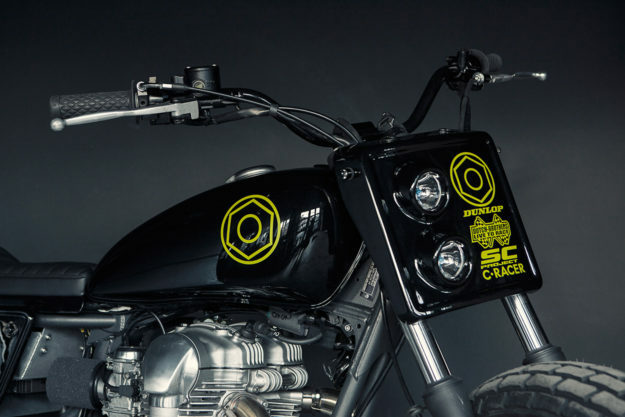 The Kawasaki is already doing the rounds of the show circuit: At the moment, it’s literally a vehicle for the Wrenchmonkees’ apparel line before it hits the track. “We didn’t get a chance to measure power or weight, but we know for sure that we stripped off at least 20 to 25 kilos [45 to 55 pounds] and it’s gained a few horsepower,” says Per. Later this year, with a fresh set of tires installed, the Kawasaki will hit the track with Nicholas on board. Let’s hope he keeps this beautiful machine upright.